WASHINGTON? As NASA Administrator Charles Boldenprepares to depart for China for talks about possible Chinese-U.S.cooperationin areas including human spaceflight, agency and White House officialsare takingcare to temper expectations about what the discussions might yield. DamonWells, a senior space policy analyst in the WhiteHouse Office of Science and Technology Policy, cautioned that numerouslegaland policy challenges must be addressed before the United States canforge acooperative partnership in humanspaceflight with the Chinese. During a two-day meeting of theU.S.Commercial Space Transportation Advisory Committee here Oct. 6-7, Wellsmade nomention of Bolden's travel plans, but said in response to a committeemember'squestion that inviting Beijing to participatein the International Space Station program is "a very complexissue" here and in China. "Thosechallenges touchissues like the need for more transparencyin the Chinese program, nonproliferation questions ? there'sa wide swathof issues that make this a very complex problem," Wells said inresponseto a question from a committee member. "I don't know when we'd be farenough along the path for that to make sense and where we'd make enoughprogress on those issues for that to make sense. I see the arena and Isee thechallenges and I just don't know how to answer your question beyondthat." Wells'comments came just over a week before Bolden's scheduledOct. 16-21 visit for introductory talks with officials in the Chinesespaceagency. The talks were called for in a joint U.S.-China statementissued by theWhite House last fall following the official state visit to Beijing byU.S.President Barack Obama. "TheUnited States and China look forward toexpanding discussions on space science cooperation and starting adialogue on humanspace flight and space exploration, based on the principlesoftransparency, reciprocity and mutual benefit," the document states. "Both sides welcome reciprocal visits of the NASA Administrator and theappropriate Chinese counterpart in 2010." Butit remains unclear whether Bolden is making his tripat the behest of the White House or on his own initiative. White Housespokesman Nicholas Shapiro declined to comment on Bolden's China visitandreferred media queries to NASA. 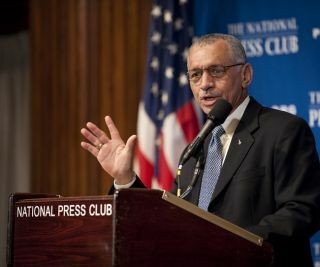 When asked about Bolden's trip NASAspokesmanMichael Cabbage referred to last November's joint U.S.-China communiqu?thatcalls for expanded discussions on human spaceflight cooperation. Cabbagesaid the trip "is being coordinated with allappropriate government agencies," even as a senior Republican lawmakerrequesteda security briefing on the visit before it happens. Inan Oct.5 letter to Bolden, U.S. Rep. Frank Wolf (R-Va.) said hestrongly opposesany partnership with Beijing that involves human spaceflight. "Ineed not remind you that no such planning orcoordination has been approved by the Congress," wrote Wolf, therankingmember on the House Appropriations subcommittee that oversees NASAspending. "In fact, several recent NASA authorization bills have explicitlysoughtto place strict limitations on coordination with China." Wolf,an outspoken China critic, is in position to becomechairman of the subcommittee next year if Democrats lose control of theHousein the November elections. "Itshould go without saying that NASA has nobusiness cooperating with the Chinese regime on human spaceflight,"Wolfwrote. Cabbagesaid NASA is currently preparing a response toWolf's letter. Duringa U.S. visit in April, a top Chinese spaceofficial said Beijing has established a good working relationship withspaceagencies in Russia, France, Germany and other countries, and that Chinalooksforward to working with the United States in space science and mannedexploration efforts in the future. Citingthe 2009 joint U.S.-China statement, Wang Wenbao,head of China's Manned Space Engineering Office, said China is lookingforwardto a visit from Bolden later this year. "Thisforms an important foundation for both sidesto carry out manned space cooperation," he said. Accordingto an Oct. 1 NASA white paper detailingBolden's trip, the visit will involve "initial discussions" withChinese human spaceflight officials and site visits to humanspaceflightfacilities. "Thiswill be introductory and will not includeconsideration of specific proposals for human spaceflight cooperation,"the paper states, adding that Chinese government officials are expectedto paya visit to NASA facilities in November. Thewhite paper also asserts that engagement with Chinain human spaceflight would be tied to the transparency of the communistcountry's space activities. Boldenwould not be the first NASA administrator to visitChina. His predecessor, Mike Griffin, led a NASA delegation there in2006 to meetwith Chinese space officials. Griffin said discussions during the tripwith histhen-Chinese counterpart, Sun Laiyan, provided insight into the Chinesespaceprogram. "Oneof the most important aspects of our trip isthe opportunity to gain better transparency and trust," Griffin said inastatement posted on NASA's website following his visit. Inan Oct. 8 e-mailed response to a Space News query,Griffin said his trip to China was "both very valuable and veryenjoyable.Our team planted the seeds for scientific cooperation, and allowed eachside togain a bit of insight into the other's perspective. Overall, it waswell worththe effort. "Wewere not able to make any significant progresstoward working together in human spaceflight. Indeed, our request totourChina's human spaceflight facilities was declined. I hope that thissubsequentvisit by a new Administrator will prove more fruitful in that respect." Thisarticle was provided by Space News,dedicated tocovering all aspects of the space industry.